The other "basics" I've tried, though they are at the beginning of the menu, may make for more substantial eating than a typical starter. The short rib "meat loaf" is not like any meat loaf I've ever had, with short rib meat that's been braised till tender then shredded and pressed back together, kind of, anyway, and plated with a sweet and smoky plaintain mash and a drizzle of sweet soy molasses. It's a rich and satisfying dish. The "southern boy" ribs are also a sizable portion if you're not sharing them. On our first visit these were done in a somewhat dry style which allowed the garnish of pickled chiles and cilantro to be a bit more pronounced, which I enjoyed; on return trips they've been more in the fall-off-the-bone, slathered with sauce school (the sauce more tangy than sweet), which I understand has its partisans too. Within the "raw" section of the menu hides one of my favorite items, one that could easily be overlooked. Described as "melons, lime, chilies," they take cubes of watermelon, cantelope and honeydew, and compress the melons under vacuum with lime juice, chile flakes (I'm guessing shichimi togarashi) and (guessing some more) a bit of rice wine vinegar: the flavors get sucked into the open cells in the melons and infused throughout, making for an incredibly vibrant burst of flavor, further brightened with a fine julienne of fresh Thai basil over the top. It is a wonderfully refreshing bite. The salads we've tried - local greens spiked with some edamame and an Asian-inflected vinaigrette, and another with Homestead avocado and tomato, orange segments, fresh hearts of palm, and bits of crunchy rice for some textural contrast - are fresh and light, but a bit monotonous (though I have been known to say that about salads generally). Several more nice little bites can be found in the "snack" section of the menu. The grilled sweet corn, topped with a tofu "shmeer," was like an Asian take on the Mexican elote, the tofu spiked with some pickled ginger, the corn picking up some smoky notes from the grill. The success of this dish depends much on the quality of the corn, though, which was much sweeter when we had it in late August than on a more recent visit a couple weeks ago. Crispy chicken skin is a chef's treat that made its way onto a menu, with about inch-long strips of chicken chicharrones resting on a puddle of chunky "Asian romesco" sauce. They're a guilty pleasure and one to be shared. Tender, sweet Key West shrimp are threaded onto wooden skewers and grilled, served with a punchy ginger and Key Lime butter; the only tricky thing here is trying to peel them if you're squeamish about chewing on their thin, crunchy shells. On more recent visits we've also enjoyed the grilled pumpkin (kabocha? ), served with a tangy yogurt sauce and a sprinkling of roasted pumpkin seeds. Another item that I first saw on a visit this past weekend was brussels sprouts with bacon and cauliflower, and it was also a winner, the vegetables getting a nice char, the bacon adding its salty goodness, with a little hit of some vinegar, I think, to cut through that richness. The only miss I've experienced in this section of the menu were the grilled shiitake mushrooms, sliced thin and glazed with a sticky sweet soy sauce, the texture somewhat unappealing and the sweetness of the glaze actually muting rather than enhancing their umami-bomb potential. I've not tried Momofuku's ramen, so I can't compare it to Gigi's. Evaluated on its own merit, I'd say it's decent but unlikely to inspire the same kind of restaurant empire. The broth, a shoyu style, has a nice pure clarity of porky flavor, reinforced by a generous helping of shredded roasted pork. An immersion circulated egg adds more richness, while fresh corn and shredded snow peas provide some vegetable contrast. The noodles are somewhat non-descript, lacking that perfectly tender but elastic chewiness, and presumably not house-made. More recently, I tried a pork and veal meatball served with sesame noodles, an odd mash-up of Italian and NY-Chinatown influences which, if the meatball were a little more moist and tender, might have just worked. There's also a Caribbean shrimp pad thai and a steak chow fun among the "noodle bowls." 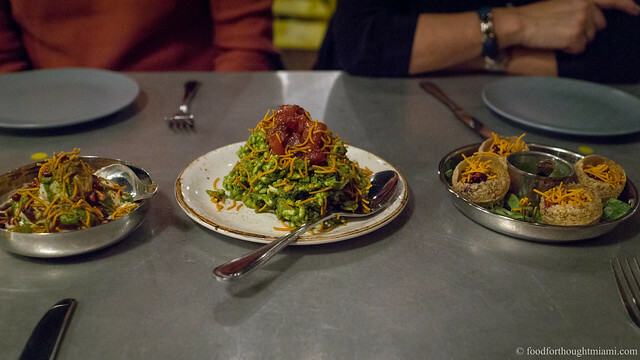 As is so often the case with menus that offer the multitudinous distractions of small plates, I've not much explored the "rice bowls" at Gigi, which are the most entrée-like items on the menu. Frod Jr. got the slow braised curried duck leg on our last visit, which must have been good because all I got to taste was the rich, creamy coconut risotto that came with it. There is also a local fish done with Chinese broccoli, fermented black beans and jasmine rice, or a crispy soft shell crab in a red curry over rice. Desserts have been somewhat hit-or-miss. Soft serve ice creams are another idea lifted from Momofuku, but the couple we've tried - yuzu and green tea - were somewhat muted in flavor, and the flavors that did come through had an artificial tang to them. A banana cream pie we had on opening weekend tasted like the banana pudding made from the recipe on the Nilla wafers box - nostalgic, I'll admit, but nothing special. On the other hand, a smoked apple crumble got everything right - the cubed apples tender but still holding their shape, with an intriguing whiff of smokiness, along with a little bacon crumble and a nice shortbread crust, all rounded out with a scope of vanilla ice cream. On one visit we had a truly exceptional chocolate chip cookie, but the cookies from our most recent meal were not as memorable. There is a solid beer selection that includes not only several micro-brews but also Sapporo on tap, as well as a shorter list of some sakes and wines. Another thing we like, particularly with the kids, is that they offer house-made "spritzers," sodas made in-house with various flavorings. They prepare a syrup by vacuuming the flavoring agent under pressure with water and a bit of simple syrup, then add it to carbonated water, and these are brightly flavored without being overly sweet. We've tried star anise, basil, watermelon-mango and apple-mint, and you get a 750ml bottle for $3. Note also that they charge $1 per person for the in-house filtered water, which some people apparently resent but I have no problem with. Speaking of prices, there has been a bit of upward creep since they first opened. That pound of ribs that was originally $12 cost $16 a couple months later. The grilled corn went from $3 to $4 (note that the online menu at their website has not been updated). But it's still a pretty reasonably priced meal, with nothing over $20 and the ability to put together a pretty good and satisfying selection of dishes for about $25 per person. Though parking in the spacious lot behind the restaurant used to be free, we were charged $3 last weekend. It seems a bit opportunistic, even if it is comparable to what you'll pay to park in the Midtown complex across the street or in the Design District. Service on all of our visits has been efficient, pleasant and knowledgeable. I was impressed, particularly on our visit the opening weekend, that our server knew not only the ingredients but the preparation methods for many of the dishes, and even brought out a jar of star anise pods for Little Miss F to smell when she ordered the star anise "spritzer." But the place gets hectic, and crowded, and I suspect there are times when things can get a little ragged. Like so many "small plates" places these days, dishes come out as they're made, which works best when you're sharing among friends. Though it has the potential to create a disjointed meal, things generally work out just fine. One small note: likely on account of the broad windows and open kitchen, the A/C is cranked pretty strong, so much so that I've literally been close to shivering in shirtsleeves here. 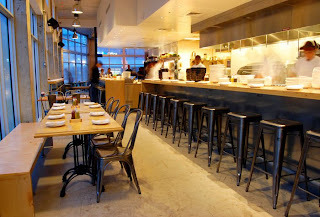 Even if it were not blatantly cribbing from the Momofuku playbook, Gigi could hardly claim to be the first place, even locally, doing "Asian inspired and freshly prepared cuisine." But that shouldn't take anything away from the fact that it does what it sets out to do quite well. As I said last week about American Noodle Bar, "[T]here's enough to distinguish each of these places from one another that I could happily round out a week of eating visiting each of them." Gigi has a well-assembled menu with high-quality ingredients, solid execution and bright flavors, and a lively space with a pleasantly bustling feel. It all makes for a fun and pleasing meal. It may not be the most original concept, but who cares so long as it tastes good? No association with Richard Blais' Flip Burger Boutique. Though I'm linking to Feast Miami for the full text of the ad, kudos are really due to Miami Restaurant Power Rankings for being the first to translate Gigi's "Greetings from the Future." I've had Momofuku's ramen multiple times. I also tried Gigi's a few weeks ago. Momofuku detractors always state that it is not an "authentic" ramen and thus is less noteworthy than other East Village ramen shops (like Ippudo). Regardless, the Momofuku ramen broth is significantly more flavorful than Gigi's ramen. Seems as if Momofuku's flavors are developed over a longer period of time. In addition, it usually includes three cuts of pork (including the belly). I was actually quite disappointed with Gigi's ramen. The broth did not wow me, and, like you, the noodles seemed prepackaged and lacked any real flavor or the ability to soak up the broth and other ingredients. I agree with Alexander about the whole ramen thing and I also think the pork buns could be better. I guess all the flaws that I find in the place come from the owner trying to mimic momofuku when it doesn't need to. The first time I dined @ GIGI back in September, it was spot on. With each subsequent visit, the food has become blander, the portions have become smaller, and the overall experience has lacked. I feel that once the place caught on, people figured out it was trendy, and the miami socials figured out how to get there, the food has gone downhill. Jeff, if you read this, please take note. As a genuine food enthusiast, you are losing your touch. I believe this place is so small on purpose so it look like its always packed and full of happy customers. In reality once you go inside you'll find overwhelmed waitresses,walking across the room and crappy food. Service was awful, I get better service from the drive thru at Burger King. The cherry on top was that they charged my credit card incorrectly and no one answer the phone during 4 days. they charged me $150 in addition to the $50 that i spent with my order of 4 "tapas" if you can call that excuse of a dish tapas. Anyways... walk 2 more blocks and go to Mercadito, service , ambiance and food is much better. whom did the design/ architecture for the space? love it.